Eczema is a wide spread issue most people face today. There are so many common irritants and things that affect it. These 6 tips are good to know and important to follow. Eczema is a skin condition that’s both frustrating, as well as long lasting. It’s also referred to as “atopic dermatitis” and it’s a chronic condition characterized by red and itchy skin. In this article we’ll go over the important things you should know if you suffer from eczema. People with healthy skin are protected from allergens, irritants and bacteria. Eczema is when the skin fails to deliver this protection and becomes very sensitive to the aforementioned external factors. 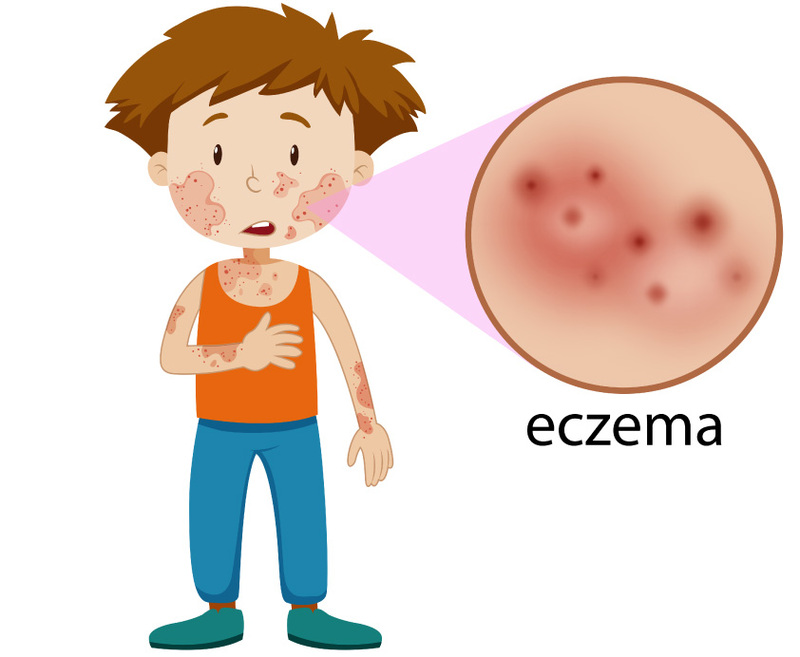 While it’s difficult to pinpoint an exact cause for eczema, there is generally a variation of several factors that lead to a person’s atopic dermatitis. Eczema can be accompanied by other health conditions, such as hay fever or asthma, and it can sometimes run in the family. As with most skin conditions, eczema has a series of triggers that one must identify in order to be able to prevent it in the future. Some of the most common eczema triggers are soaps and other cosmetics, weather, stress, and even food allergies. Doctors looking to identify if a patient suffers from eczema will perform a skin examination. They will ask questions about a person’s medical history, as well as in-depth one that will help determine what situations or products alleviate or worsen the symptoms. Patch tests are performed to identify or rule out other potential skin diseases. Parents should discuss with their child’s doctor about any potential food allergies that could cause the rashes. What are the common meds for eczema? It’s important to know that atopic dermatitis is persistent, which means that doctors can prescribe a variety of treatments in order to identify which one renders the best results for a specific patient. Medical history and skin exams will be part of the diagnosis process, which may yield results that show some other health conditions that accompany a person’s eczema. A common form of medication given to people who suffer from eczema is corticosteroid cream. This should be applied only after the skin has been moisturized, as this helps the skin absorb the medication better. Be aware that excessive use of such creams can thin the skin. Some other drugs prescribed for this condition are called calcineurin inhibitors (the most common ones are pimecrolimus and tacrolimus), They are not suitable for children, as they are believed to affect the immune system. If a person who suffers from atopic dermatitis has a skin infection, doctors can prescribe antibiotic creams to help fight it off. These creams are also useful in case the skin is cracked or has open sores. Such creams may be accompanied by oral antibiotics that help treat the infection. There is also a newer form of eczema treatments, which has been recently approved by the FDA. Dupilumab is an injectable biologic treatment that’s recommended for people that have a severe form of eczema and showed no improvement after having been subjected to other forms of medication. Because it’s quite recent, there aren’t that many recorded successes. While being safe to use, this treatment is very expensive. What are some common eczema therapies? Atopic dermatitis has two different types of therapies related to it: those that help improve the condition, and the psychological ones, which imply counseling and learning how to cope with it. People who suffer from eczema can become very frustrated with this condition, as skin marks make them feel self-conscious. Some relaxation therapies are also recommended to patients who tend to scratch their skin very often. Phototherapy is a common practice amongst eczema sufferers that have yet to experience any improvements after having tried other forms of medication and topical treatments. This light therapy implies exposing the patient to small amounts of natural sunlight, but there are cases where UV light is used. On the long term, light therapy can save a series of side effects, like premature skin aging, sunburn, or even headaches and nausea. Because of the risks, phototherapy is rarely used to treat children. Wet dressings are also a common form of treatment, which implies applying topical corticosteroids on the affected area, and then wrapping it with wet bandages. A major benefit of this technique is that it doesn’t allow people to scratch their skin so often. Because this is a very intensive process, nursing expertise is required. To avoid hospitalization, doctors may teach some of their patients how to perform these wrappings at home. Atopic dermatitis is a condition that requires constant check-ups and visits to the doctor. Typically, the person to see if a dermatologist, a doctor who specializes in skin conditions. In preparation for this appointment, everyone should be prepared with a list of symptoms that trigger the eczema, another one with all the medication taken in the past and present, plus questions for the doctor. It’s important not be afraid or embarrassed to ask all the questions needed to stay informed on the subject. What self-care methods are good for eczema? A change in lifestyle is often required when a person discovers they suffer from atopic dermatitis. Moisturizing is a priority. Finding the right combination of creams and ointments could be tricky, and it takes a lot of experimenting. Children are advised to moisturize twice per day. Areas that are itchy should be treated with some anti-itch cream, preferably one that contains at least 1 percent hydrocortisone. People who suffer from eczema should avoid scratching by any means necessary, as this further irritates and damages the skin. Bandages can sometimes help, as they offer protection. There are also anti-itch meds available for purchase, and it’s best to combine them with allergy medication. People that wear uncomfortable clothing can also tend to scratch their skin. Avoid clothes that cause irritation or have an itchy texture. In high temperatures, one must avoid excessive sweating by dressing appropriately. Atopic dermatitis is a condition that typically starts in childhood. It’s spread worldwide but known to affect people in urban areas. While this is a condition that may also end in childhood, people who suffer from it tend to have dry skin or infections throughout their entire lifetime. Could eczema be caused by an underlying medical problem? Arnica cream/gel to help my eczema? How to treat eczema for a baby? Could being hyperthyroid cause eczema too?